It is unclear whether London is enjoying an Arthur Miller renaissance or whether he is one of those playwrights, like Ibsen or Chekhov, who is bankable enough and with enough star roles in the canon that he will always hover on the fringes ready for a new production. Either way, David Suchet and Zoe Wanamaker combined in a pretty much perfect, highly traditional, All My Sons back in 2010, whilst earlier this year Ivo van Hove gave us a radically stripped back A View From A Bridge built around an absolutely blistering performance by Mark Strong. 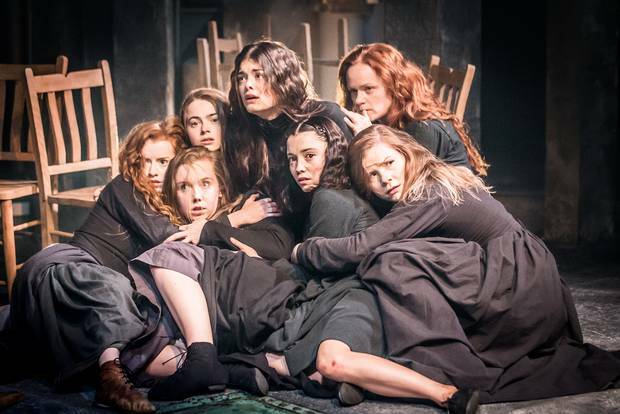 Now, just metres down the road from where Strong put in a decent early bid for performance of the year, we have Miller’s The Crucible; a play that is audacious enough to not just have one Eddie Carbone role but several. 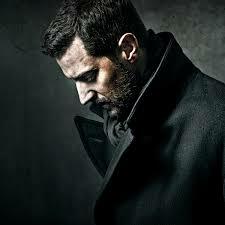 It is Richard Armitage, playing John Proctor, who dominates the posters – one presumes Hobbit-y fame and a suitably jawline is the primary reason for this but it is a rather misleading image; Proctor may be a central figure, but this is a play that revels in a large cast and in the searching light that Miller casts across the residents of Salem. That minor quibble aside, a mark of the power of this production is that the audience sat rapt for 3½ hours on the hottest day of the year whilst being subjected to periodic blasts of burning herbs and smoke effects. As good as Miller’s writing may by, those conditions did have the potential to induce a most literal understanding of the play’s title to the poor, sweltering audience members. It is to the full credit of Yaël Farber that the long running time rarely seems like a drain and the action, simply staged but highly evocative of the period, speeds along building an inexorable momentum through to the third act climax before the sudden transition to a final act of quiet, where the heady atmosphere that has propelled the trials disappears with the disappearance of Abigail and space is given to reflection, on both spiritual and human levels. This is the much-needed calm after the storm and the reflection is for both Miller’s characters and for the audience who are suddenly pulled back out of the manic paranoia of the town. Farber was responsible for the wildly successful Mies Julie – a South African-set re-examining of Strindberg’s classic – and given the contemporary allegories can be seen as strong now as they were when Miller wrote the play in the long shadow of McCarthyism, it must of have been tempting to look for a way to pin The Crucible to the modern world. However Farber plays it straight and lets the parallels speak for themselves. 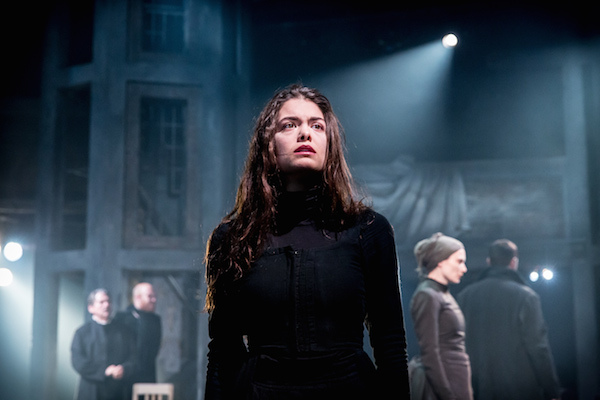 It is Miller’s ability to create characters that are of their time but are yet clearly visible in the 21s century that makes The Crucible such an enduring work. The manipulations of Abigail, the fallibility of John Proctor and the hypocrisy of Judge Danforth are traits that are, and will remain, commonplace for as long as there are still humans walking the earth. The characters in The Crucible may talk in terms of the soul but Miller’s writing is concerned about the psyche. There may be much talk about God and the Devil but it is human emotion that drives much of the action and Farber conjures up periods of quiet amid the maelstrom that allows the audience a moment to glance into the hidden frailties of the characters. It is there when we see the look on Elizabeth Proctor’s (Anna Madeley) at the point she realises that when she stopped being a ‘good’ woman in order to protect her husband, she had in fact damned him, or it can be seen in the wheedling nature of Cheever’s response to Proctor that ‘I am the clerk of the court now, y’know […]’. We see in an instant that this is not a man doing what he believes but one who has seen the way the wind is blowing and the material advantage of taking sides; we see that to the very core this is a man who is dangerous precisely because he is weak. It opens with a striking simple image of the cast gathered on stage subject to full scrutiny from the audience and from each other; each is tense and averting their gaze. It is a powerful opening and suggestive of a community where suspicion is the norm. Farber summons up a number of similarly powerful montages and these tableaus are presented with the air of ritual that continually brings the play back to the town’s obsession with religion, devilry and witchcraft. The performances across the cast are uniformly excellent but the standout performance must be Adrian Schiller’s Reverend Hale. He captures perfectly the journey from pious observer who believes his own rhetoric about impartiality to a man slowly suffocated by Salem’s toxic atmosphere; his authority pincered between the elitist, disdain of the political Judge Danforth and his own questioning of the legitimacy of his opinions as events unravel. If there is light to be seen at the end of Salem it is through Hale and the journey that he appears to embark upon towards a personal salvation; he finds that God does not exist in damnation but in providing succour to the damned. Richard Armitage gives a brooding physicality to John Proctor. He is well cast in the role and is strong as the man standing alone in the community and who, as is the nature of things, must become undone. He is able to bring a suitable gravitas, an unspoken dignity to his action, which is supported by a quietly menacing air of man who is no saint and is capable of physical harm. Armitage and Schiller are excellent in the scene in Proctor’s house when Hale calls upon Proctor to prove his beliefs; the barbed exchanges a reminder that most of the play has the adversarial nature of a courtroom in its conversation and that dialogue is often presented as if through the accused and accuser. It is an audacious move by Miller to write a play about the Salem Witch Trials and then not have any courtroom scene but the closest we come is Act III where the judges set up an ad-hoc courtroom to hear Mary Warren’s testimony. However within the play this absence seems natural and only serves to highlight that this type of ‘crime’ and the accusations of it are not something that can be captured in a legal process – it is about people, small town communities and petty squabbles, and it is about the whispers, the shadows and the chance to find advantage in long-running feuds over property rights. Other honourable mentions must go to William Gaunt (winner of Civilian Theatre’s Best Supporting Actor award for his superlative Dogsborough in last year’s Arturo Ui) who brings a real pathos to Giles Corey; a man bearing the guilt of a misjudged comment that sees his wife accused and who finds himself crushed in the face of the hypocritical moral certainties of the court. Ann Firbank is brilliant as Rebecca Nurse who, despite her weak frame, stands to the end as an immovable force against the prevailing madness. The witches themselves are also well portrayed and, with a nod towards Village of the Damned, exist in a private world of glances, furtive eyes and mute silence under the control of Abigail. The climax of their power is in the frenetic finale to Act III and it is here where a production could go off the rails but it was handled superbly; the stage, encircled by the audience, becomes its own cauldron; an overwhelming mixture of noise, smell, frantic energy and confusion. The audience are plunged right into the heart of the community and for an instant you can see the witchcraft that so convinces the townspeople. If this production does not quite reach the heights of van Hove’s masterful A View From A Bridge then that is because it is a very high bar to reach. Farber’s production of The Crucible is an assured handling of the play that keeps it well framed in the past but has a staging that is very modern, an absence of clutter, functional props and underpinned by superb lighting and sound design (Tim Lutkin and Richard Hammarton) that are essential in pulling the audience back to the world of Salem. It is held together by a strong cast, some excellent performances and a narrative that retains its power both in the 50 years since it was written and the 300 years since it was set.